Step 1 In a square glass baking dish, stir together garlic, honey, lime juice, soy sauce, ginger and coconut oil. Step 2 Add green onions, shrimp, pineapple and red pepper, tossing to coat. Alternately thread 3 pieces green onion, 2 shrimp, 2 pieces pineapple and 2 pieces red pepper onto each of 12 metal or soaked wooden skewers, discarding any excess marinade. Step 3 Place skewers on a greased grill over medium-high heat; close lid and grill, turning once, until shrimp are pink and pineapple is lightly charred, 4 to 6 minutes. Remove to platter; sprinkle with toasted sesame seeds. 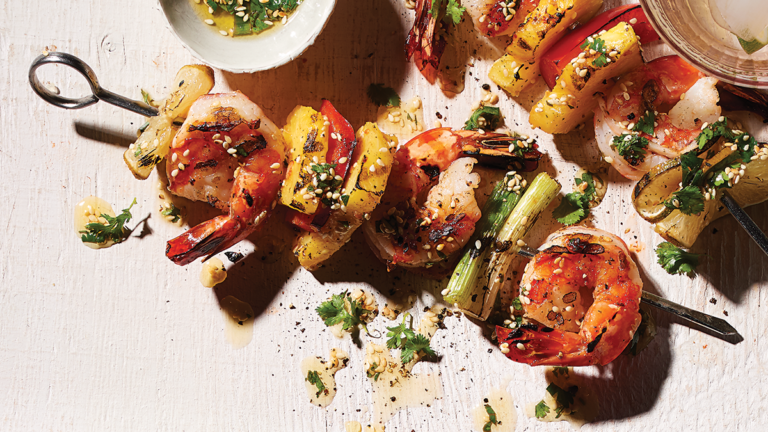 Once grilled, the shrimp and pineapple are easy to slide off skewers and into your wrap of choice. Serve with lime wedges and sliced avocado. Best Health tip: Soak wooden skewers in water for at least 15 minutes before threading food onto them.